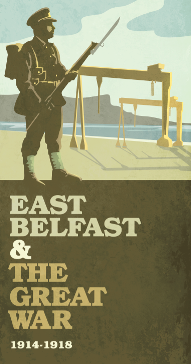 Next Wednesday, 13 August, will see the launch of 'East Belfast & The Great War', a community research project that aims to tell the story of WW1 through the eyes of the men and women of East Belfast. The initial focus of the two-year, heritage lottery-funded project, which is being co-ordinated by historian Jason Burke, is to gather details of every serviceman from East Belfast who served in the Great War. This information will then be made available online on a soon-to-be-unveiled dedicated website. The launch will take place in The Great Hall, Parliament Buildings, Stormont at 7pm, and the guest speaker will be Professor Richard Grayson. The research methods to be used by the new project are modelled on those developed by Professor Grayson in the research for his book Belfast Boys - How Unionists and Nationalists fought and died together in the First World War. To attend the launch and learn more about the project, you need to reserve a place by emailing eastbelfastgreatwar@hotmail.co.uk or telephoning 07966 931 410. Don't delay. The deadline for reservations is Friday 8 August.